I used to think that when people said they knew exactly where the were the moment JFK was shot, or a war began, etc., that there was NO WAY they knew EXACTLY every detail. I thought, "not possible." Until September 11, 2001. I was 17. I was a senior in Mr. Andrews' Marketing class. It was the strangest, eeriest, most confusing day, to say the least. I remember being in denial that it could possibly be "on purpose," or a terrorist attack. Then, feeling violated. "What was happening?!" Even if it wasn't being said, there was panic throughout the halls. Quiet panic. I remember calling out of work and going to home to an empty house while my mom was still at work for a little while. I had been home alone plenty of times. But, this was different. I didn't want to be alone. I couldn't grasp what I was seeing. What was happening. I remember worrying, "Is it over yet?!" I lived in a town with a power plant, "Was that next?!" It was the most unsafe I (as well as many others) have ever felt, to this day. The world changed that day. At 17, I became a lot less naive about the world that I lived in. A lot more skeptical. A bit less carefree. I'm sure we all did. I didn't lose any family or friends, but I did feel loss. And with each year, I feel more and more emotional about it. I see the children who were young, sometimes even infants or yet to be born when their loved ones were taken, and I, now a mom, cry at the thought that they don't know their moms or dads. Or I see the husbands and wives who's "happily ever after" was cut short and I, now a wife, feel their heartache. It's so strange because with each year, I feel more affected by the loss of innocence. This year especially. My Uncle, Tom, is a fireman for the NYFD. He was not my uncle at the time, but is now, and I am always in awe of his bravery, and how humble he is while doing it. He responded to Ground Zero that day and spent many months helping in the recovery. I've heard him tell stories of that day, of the brothers he lost, and how apocalyptic it was. I don't think I could put into words how much I admire him. He's a great guy and our family is lucky to have him as a part of ours. He gave Hubs and I the most amazing opportunity this summer. 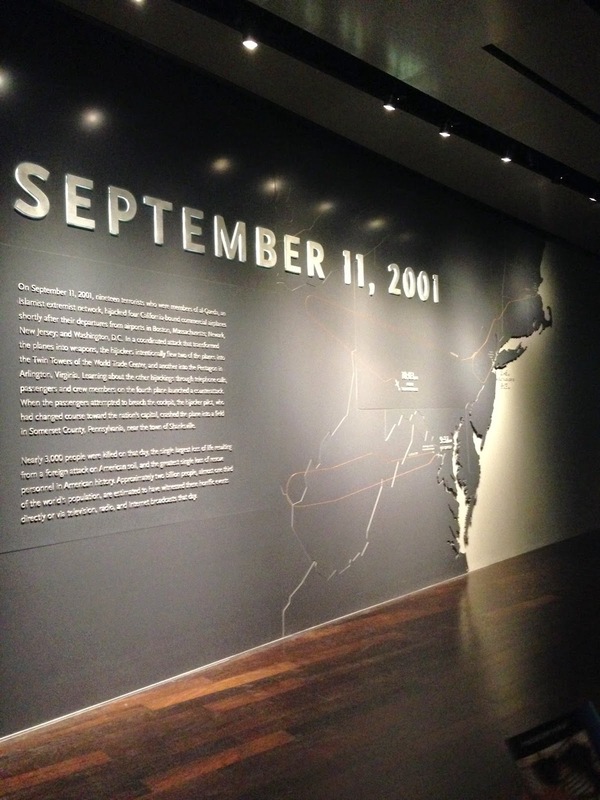 When the 9/11 Museum opened, they first opened it up to all of the first responders, their families, and residents of the area, and he let us go with him. To say that it was emotional is the understatements of all understatements. It was like it had happened the day before. It was tragic, yet beautiful. Hubs and I sort of felt like outsiders because we knew that everyone we were walking around with were there. These were THEIR memories, they LIVED right in it. We would be walking around looking at pictures and hear people (including my uncle) say, "Oh look, there's _____" It was surreal. Things like wallets and eyeglasses, and bikes. Broadcasts from the moment it was happening... one minute they were talking about who's dating who in the celebrity world, and the next we were under attack. Voice mails to and from loved ones... the last ever exchanged. The dispatch calls, calling pretty much every possible unit who wasn't already there. It was unbelievable. We were there for a few hours, yet I am sure that we could have spent even more. I am so thankful for that experience, and one day, when they are old enough to comprehend it, I will walk with my girls through the museum and tell my "I remember" story. And show them that among all of this chaos, we, as a nation, as human beings, persevered. That good will always win over evil. I will Never Forget that day. Thank you to all the men and women who serve our country, the people who put their lives on the line for the safety of others. You are heroes that walk among us. You are an amazing and beautiful person in every sense, I am more than proud that I am your uncle and your my niece.